We are experiencing a problem here. Since we adopted DHIS2 in 2014, the Ministry of health has changed its reporting tools twice. Yet we also had to import legacy data into the system from as far back as 2008. The most common change has been change in the dis-aggregation of certain data elements. Say from Male < 15 and > 15yrs to Males <1yr,5-10yrs,11-15ys,and so forth. In order to be able to have both legacy data,and new data entered into the system, we have developed 2 similar data elements in instances like these but with different dis-aggregations. Is there a way of keeping only one data element for both legacy data and new data with the different dis aggregations without duplicating data? For analysis purposes this would make both our data elements and indicators constructed from them fewer and more manageable for the users! 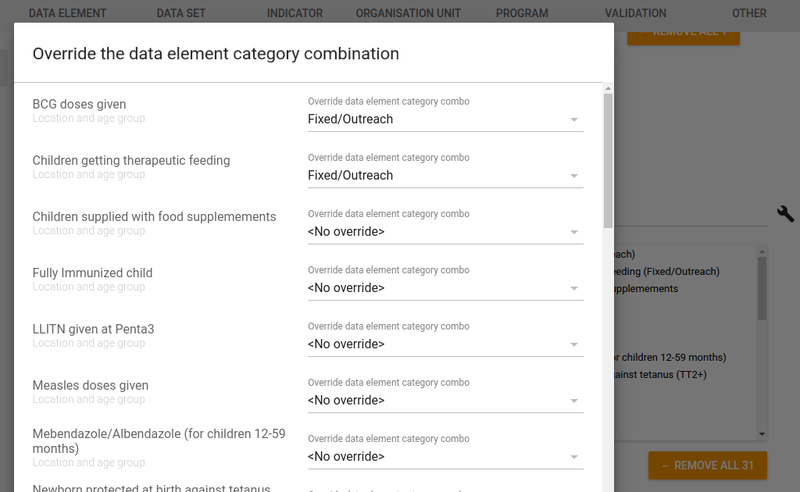 Yes you can achieve that using the option for overriding the category combination (disaggregation) for data elements based on their membership in a data set. This feature was introduced in version 2.25 so you will have to upgrade to 2.25 or later. Ensure that you have created all categories for the new dis-aggregation. Create a new data set using the existing data elements. In the add new data set screen, click the gear icon placed above the data element selection area to the right. For each data element, select the category combination to use for this particular data set. Assign this data set to the appropriate organisation units and user roles. Remove the legacy data set from any organisation units. In data entry, you should now be able to enter data for the new dis-aggregations. This process can be repeated every time the dis-aggregations are changed, and avoids the need for creating new data elements. Is it possible to drill down in the DHIS2 visualizer?